London: Leonard Smithers, 1896. No. 1, January, 1896. 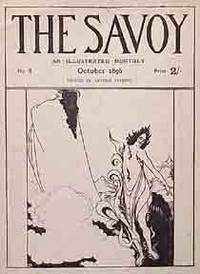 The first issue of this periodical that featured various writers and artists of the nineties, the most prominent and recognizable of whom was Beardsley. Publisher’s pink boards; some wear, especially at the extremities; bookplate; 1948 gift inscription, about very good, but in the rare (or apparently unrecorded) dust jacket. 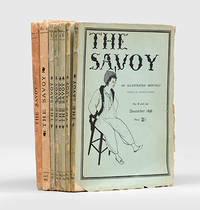 The jacket is plain brown paper on which the cover illustration (designed by Beardsley, but on white or cream paper) is mounted. The jacket has marginal wear and chips, missing small portions at the spine ends, which have also suffered on the binding; the jacket wear corresponds to wear to the volume. This copy does not have the Christmas card often found with the volume. London: Leonard Smithers, 1896. First Edition. Hardcover. 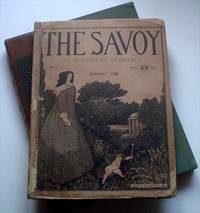 1st edition of the collected 3-vol edition of this 1890s periodical. 4to, publisher's blue, gilt decorated cloth. profusely illustrated with b/w drawings, many by Beardsley, publisher's ads; few leaves unopened, foredges & topedges uncut and somewhat dusty, spine ends bumped & bit worn, lower rear joint v.1 has neat minor repair, front hinge v.1 weak, glue marks on front pastedown of each vol from apparent bookplate removal. A very good, bright set of this immensely interesting periodical with the Beardsley illustrated Christmas card present in v.1. .
London: Leonard Smithers. Nearly fine copies in the original gilt-decorated cloth. 1896. 1st. hardcover. 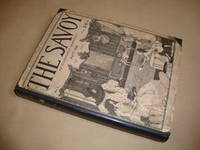 4to, 872 pp., Complete set of The Savoy in the publishers blue cloth with gilt decoration by Beardsley. Includes the Beardsley card tipped-in opposite the last page of issue no. 1. Nice, bright set with only faint rubbing at corners. From the library of Richard Meyer of Breslauer & Meyer, Berlin booksellers, with his bookplate on the pastedowns of each volume. An additional bookplate on the front free endpaper of Volume I of Curt & Emma von Faber du Faur (of Yale). .
London: The Savoy, ca. 1890s. 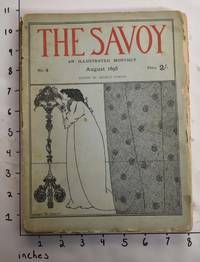 Original cover for an issue from the 1890s; slightly foxed. London: The Savoy, 1896. 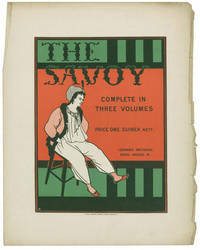 Original cover for the issue of The Savoy of January, 1896; slightly foxed. 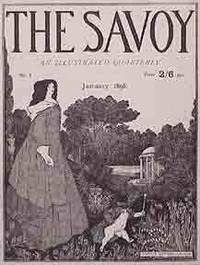 London: The Savoy, 1896. 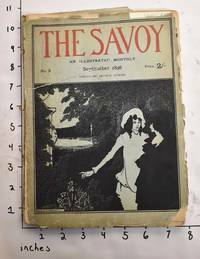 Original cover for the issue of The Savoy of November, 1896; slightly foxed. 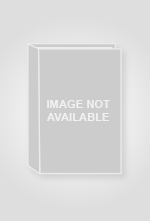 London: Leonard Smithers, 1896. iv [ads], 170pp. Joints cracked and spine rubbed. Internally fine. Bound in the orginal pink boards illustrated by 'Aubrey Beardsley 1896'. PLEASE EMAIL FOR PHOTOS. Leonard Smithers imprint to the rear board. 1st Edition. Hardback. V.g.. 4to. London: The Savoy, 1896. 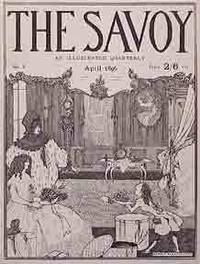 Original cover for the issue of The Savoy of April, 1896; slightly foxed. London: The Savoy, 1896. 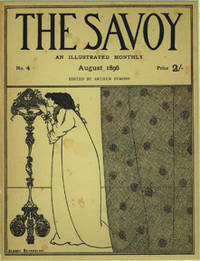 Original cover for the issue of The Savoy of October, 1896; slightly foxed. London: The Savoy, 1896. 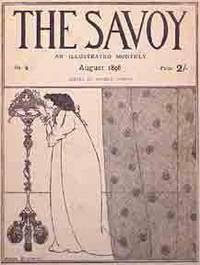 Original cover for the issue of The Savoy of August, 1896; slightly foxed. [London], 1896. Original printing of cover in matte. 25.5 x 19 cm. Lightly stained. The Savoy, No. 4, August 1896. London: Leonard Smithers, 1896. iv [ads], 206pp. Bound in the orginal pink boards. Joints cracked and spine rubbed. Internally fine. Illustrated by 'Aubrey Beardsley 1896'. Two extra front covers bound in at the rear. Leonard Smithers imprint to the rear board PLEASE EMAIL FOR PHOTOS. 1st Edition. Hardback. V.g.. 4to. London: Leonard Smithers, 1896. Paperback. Poor. Front cover is detached, soiled, worn. Page edges show shelf wear, some rips and crinkles, age toned. Moderate foxing throughout, though text is mostly clean.. Beardsley, Aubrey. Teal wraps with red lettering and black illustration. 100 deckled pp. 11 BW illustrations. A collection of lovely stories and poems by various authors, including Ernest Dowson, W.B. Yeats, and Ford Madox Hueffer, among others. London: Leonard Smithers, 1896. Paperback. Poor. Front cover is detached, has wear, foxing, rips. Back cover and last two leaves are detached, cover is creased. Spine is missing. Page edges show shelf wear, some rips and crinkles, age toning. Heavy foxing throughout, as well as heavy stains and soiling. Reading copy only.. Beardsley, Aubrey. Teal wraps with red lettering and black illustration. 92 deckled pp. 8 BW illustrations. A collection of lovely stories and poems by various authors, including O. Shakespear, W.B. Yeats, and Ernest Rhys, among others. London: Leonard Smithers, 1896. Paperback. Poor. Remnants of back cover are detached, heavily soiled, worn. Front cover has soiling, wear, foxing, rips. Spine mostly missing. Page edges show shelf wear, some rips and crinkles, age toned. Moderate foxing throughout, though text is otherwise clean and readable. A good reading copy.. Beardsley, Aubrey. Teal wraps with red lettering and black illustration. 96 deckled pp. 9 BW illustrations. A collection of lovely stories and poems by various authors, including Ernest Dowson, W.B. Yeats, and Osman Edwards, among others.